Anne Wilson, scribble, 2017, Cloth, hair, thread, 11.5 x 55.5 x 2 inches. Rhona Hoffman Gallery is pleased to present “a hand well trained,” Chicago-based artist Anne Wilson’s fourth solo exhibition at the gallery. Softly layered, richly textured, and precisely stitched, the artist’s textile works transform ordinary materials and inspire intimate observation. Anne Wilson’s practice investigates the textile industry’s social underpinnings and the politics of re-use by laying bare fabrics’ previous lives. 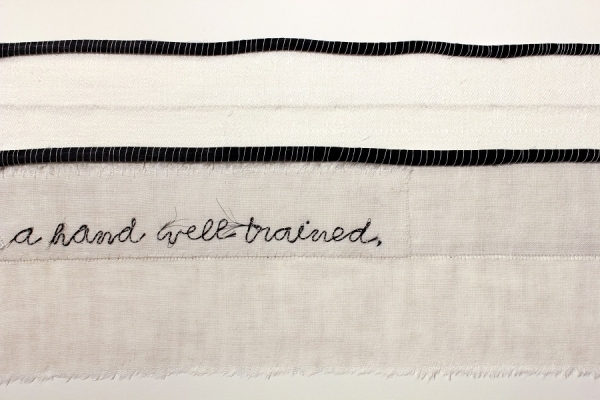 The new works in “a hand well trained” continue her conceptual deconstruction of textile and material studies, investigation of social and labor concerns, and intersections between text and textile. In her framed horizontal “material drawings” Anne Wilson scrupulously stitches along the layered edges of found linen and cotton; or in works titled “Draw Out,” she extends a coarse, colored fiber line until it nearly disappears into the cloth like a musical decrescendo. Meanwhile “Body Into Culture,” a large wall installation of tall, slit fabrics with hair and colored stitching, provides a more visceral relationship to the viewer’s body. In two sculptural works, Anne Wilson has laid out strips of cloth with reverse stitching resembling asemic writing; upon close observation, one can detect the individual hands of the artist and her studio assistants within the stitched edges. The manifold works in Anne Wilson’s “a hand well trained” overlay text, textile, and texture to entice viewers with close observation of the visual and social possibilities in the material world around us. 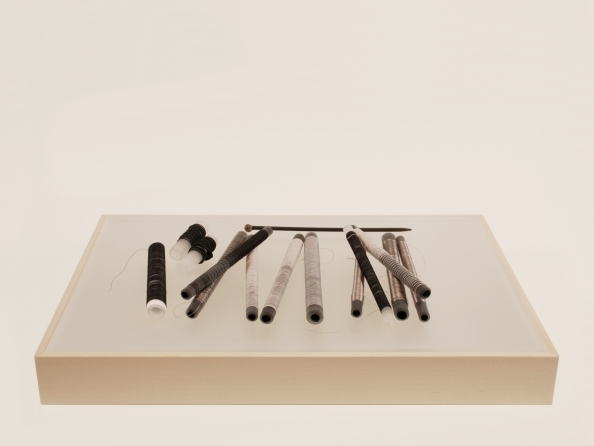 Anne Wilson is a Chicago-based visual artist who creates sculpture, drawings, performances and video animations that explore themes of time, loss, and private and social rituals. Her artwork embraces conceptual strategies and handwork using everyday materials -- table linen, bed sheets, human hair, lace, thread, glass, and wire. She has exhibited at the Museum of Arts and Design, the Whitney Museum of American Art, and The Drawing Center, New York, Museum of Contemporary Art-Chicago, the Institute of Contemporary Art, Boston, the Knoxville Museum of Art, the Contemporary Arts Museum Houston, and internationally at The Whitworth Art Gallery, Manchester, the Victoria and Albert Museum, London, the 21st Century Museum of Contemporary Art, Kanazawa, Japan, and the Zhejiang Art Museum, Hangzhou City, China, among other institutions. Anne Wilson was named a 2015 United States Artists Distinguished Fellow and is the recipient of awards from the Driehaus Foundation, Artadia, the Tiffany Foundation, NASAD (Citation Recipient), Cranbrook Academy of Art (Distinguished Alumni Award), the National Endowment for the Arts, and the Illinois Arts Council. Anne Wilson's work is in the permanent collections of the Metropolitan Museum of Art, New York, the Museum of Arts and Design, New York, The Art Institute of Chicago, the Detroit Institute of Arts, the Victoria and Albert Museum, London, The Whitworth Art Gallery, Manchester, England, and the 21st Century Museum of Contemporary Art in Kanazawa, Japan, among others. Anne Wilson is a Professor of Art at the School of the Art Institute of Chicago.